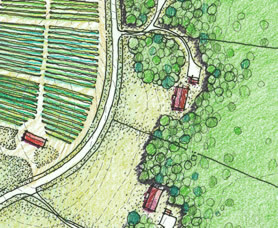 Harvest is a one-of-a-kind site, adjacent to both the Haw River and the Jordan Lake State Recreation Area. Our unique location provides direct access to great places to sail, canoe, kayak, fish, hike, and bike. Wildlife such as bald eagles, great blue herons, cormorants, deer, beaver, wild turkeys, ospreys, red-tailed hawks, and belted kingfishers are commonly seen around the lake. A system of trails and connected open spaces provides great locations to watch the wildlife and take part in outdoor activities. Jordan Lake, with nearly 14,000 acres of open water, provides extensive opportunities for outdoor recreation. The park contains a total of 47,000 acres of public lands, providing access to diverse Piedmont ecosystems, boat launches, and recreational beaches. All of this is just a short walk from Harvest. Approximately 110 miles long, the Haw River begins in Forsyth County and flows south through the Piedmont. Four miles south of Jordan Lake, the Haw joins the Deep River to form the Cape Fear River, which continues on to the Atlantic Ocean. The Haw is enjoyed by those who love the outdoors, and several local groups are committed to its protection. Portions of the Haw offer Class 2 rapids for paddlers. Historic mill towns, vineyards, and small farms are found along the banks of the Haw, adding to its unique character. Just a few miles north of Harvest, the Lower Haw River State Natural Area provides a trail system that follows the river. Efforts are underway to create a regional trail system that reaches from Jordan Lake to Guilford County, connecting various paths into a single 70-mile trail. This trail follows the boundary between Harvest and the Jordan Lake State Recreation Area. Interpretive signs describe the plant species on the trail and reveal the history of previous farm fields that are naturally returning to a forested state. The trail currently connects the Northern Farm and the Haw River, with a short, easy hike of 0.4 miles. Eventually the trail will become part of a longer loop trail that connects the Northern Farm with the Central Farm and Riverfront Park. 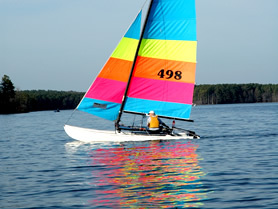 Jordan Lake has eight boat ramps, providing access to sailing, canoeing, and kayaking. The lake is just a short walk from Harvest, accessible via the community trail system.